Home Grown was an American rock band formed in 1994 in Orange County, California. They released three full-length albums and several EPs before going on indefinite hiatus in 2005. 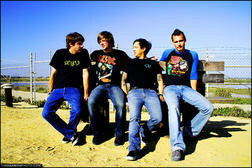 Their music is often characterized as pop punk, lyrically favoring humor and silly or satirical subjects. The original recording lineup of the band consisted of John "John E. Trash" Tran on guitar and vocals, Adam "Adumb" Lohrbach on bass and vocals, Ian "Slur" Cone on guitar and backing vocals, and Bob Herco on drums. The quartet began experimenting with elements of punk rock, pop, surf and skate music, and humorous lyrics to craft their sound. They released their first album That's Business the following year through Liberation Records. Though rudimentary, the album established the band's presence in the prolific southern California music scene of the 1990s and included several songs that would become fan favorites, such as "Surfer Girl" and "Face in the Crowd." The band played many shows in southern California and embarked on some of their first tours. In 1996 the EP Wusappaning?! was released by Swedish label Burning Heart Records. The band signed to major label Outpost Recordings and released their second album Act Your Age in 1998. It increased their popularity and they toured extensively in support of it. Cone left the band shortly after and was replaced by Justin Poyser. This lineup released EP Phone Home in 1999. Later that year they toured with the band Limbeck, which whom they recorded a split EP called Connection. In 2000 Home Grown experienced significant lineup changes. Herco was forced to leave the group in order to undergo surgery and rehabilitation for a brain tumor. Poyser also left the band, leaving them without a second guitar player. Lohrbach and Tran recruited Darren Reynolds from the band Longfellow as their new drummer, and spent some time searching for a suitable second guitarist. In addition, their label Outpost folded and the band were without a recording contract. Eventually the band decided to continue on as a trio without a second guitarist, and signed to independent label Drive-Thru Records. In 2002 the band released Kings of Pop, their third album which gained them nationwide recognition. Shortly after its release they added second guitarist Dan Hammond and filmed music videos for the songs "You're Not Alone" and "Kiss Me, Diss Me." They performed on the Drive-Thru stage on the Warped Tour and toured extensively in support of the album. In 2004 they released the EP When it All Comes Down, a more mature effort that abandoned the humorous topics of their previous releases in favor of more emotional subject matter. In February 2005 Lohrbach left Home Grown to join the band New Years Day. The band continued on without him for a time, playing live shows with guest bassist Ted Vega. Eventually, however, the members drifted on to other projects. Tran started the band Red Panda with Bill Uechi of Save Ferris, Hammond joined Paper Models, and Reynolds started Defender. In 2006 Home Grown's official website went down and their MySpace profile announced that they were on "indefinite hiatus." The band has not played together or recorded since October 2005.